Poland's Behemoth are riding high at the moment. Their most recent studio effort, 2007's The Apostacy, was very well received and has seen the band travel the world playing countless shows in support of the album. After sixteen years, eight studio albums, and one DVD (live and doco), it seemed the time was right for the group (who are vocalist/guitarist Nergal, bassist Orion, and drummer Inferno and now ex-guitarist Seth) to unleash their first live album. Recorded during the band's extensive touring cycle for The Apostacy, this fifteen track live assault captures in peak form. When the intro Rome 64 E.V is done, the first thing that will knock you on your arse is the absolutely crushing sound captured on this live album. Not only is it ball tearingly ferocious, it also is very well balanced from the drums and bass to the guitars and vocals - everything is in its place and you'll agree completely by the time Slaying The Prophets Ov Isa is done. The crowd isn't ignored either with their rousing response during and of course in between songs sounding loud and strong. In fact, it sounds like they are playing to quite a packed house. Behemoth fans are given the full treatment of faves - Demigod, Conquer All, Slaves Shall Serve, Christians To The Lions and a highlights package of material from The Apostacy. Combined with the aforementioned wall of sound and a blistering performance from the band, Live Apostacy is a real treat for fans clocking in a just over 65 minutes. Fans of Inferno's work behind the kit are also treated to a brief drum solo. Unlike some drum solos in the past, Inferno's isn't one that will bore you to tears. Seventy-odd seconds in total and it's all said and done. It's a nice change up that doesn't detract from the show's momentum either. Behemoth are going from strength to strength and clear, At The Arena Ov Aion - Live Apostacy is a testament to the band's status. 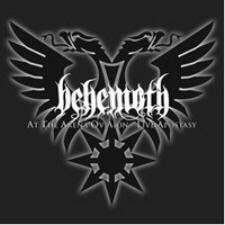 Loud and proud and complete smoking, this is absolutely essential for Behemoth fans.